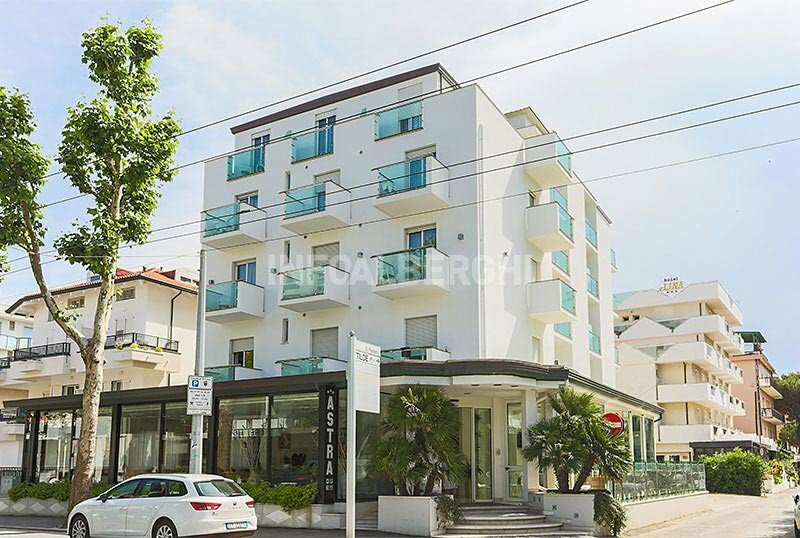 The 3-star Hotel Astra is a family-run hotel in Riccione, just a few meters from the sea in the central area. It pays particular attention to families with many services dedicated to children and has a free fiber-optic Wi-Fi connection and private parking. Admits small and medium-sized pets. The hotel is located on Viale D'Annunzio, Riccione's seafront, and is therefore very close to the beach. The area is central and allows you to reach in a few steps Viale Dante and Viale Ceccarini. The rooms are all completely renovated and equipped with: balcony, electric shutters, air conditioning, free WI-FI fiber, safe, satellite TV and digital terrestrial 20 ", telephone and bathroom with hairdryer and shower. Open-air porch, new fully air-conditioned lobby, bar area, reading corner with a small library with magazines and books for adults and children, laundry service and bicycles available for free use. WI-FI : fiber and free throughout the structure. BREAKFAST : international with rich sweet and savory buffet, yogurt, fruit juices, ring-shaped cake, warm croissants, cold cuts and cheeses; cappuccino and coffee prepared at the bar. LUNCH AND DINNER : 3 choice menus of meat and fish with romagnola recipes, pasta and homemade desserts. All meals are followed by a buffet of vegetables and appetizers. VARIATIONS : the menu offers choices suitable for vegetarians. OTHER : the kitchen organizes themed dinners with typical products. In the hotel : bicycle seats, reading corner, baby club, mini club, pediatrician, baby sitter service on request. In the room : free cot up to 2 years, anti-fall rails and light for the night. At the restaurant : flexible hours for meals, baby food, baby menu, baby bottle service, baby cutlery, colorful placemats and high chairs. On the beach : playground and mini club. The hotel has an agreement with the equipped beach Bagno n. 105 with a wellness spa pool, with salt water at 33/34 °, hydromassage and water games. The bathroom also has entertainment, children's playground area, hot and cold showers, private cabins, WI-FI, reading corner with newspapers and books. Celebrate your Easter with us! Take advantage of the long bridges of 25 April and 1 May. We are waiting for you with an unmissable offer. In Formula B & B starting from € 25.00 per person per night in a double room. Contact us for your quote. Our Hotel is very close to the New Sports Hall where the Fencing Championships will take place. In Formula B & B starting from € 30.00 per day per person in a double room. At the next National Tecnocasa Convention, come and stay at the Astra. Double room starting from € 30.00 per day per person. Check out Good Awakening "